Mandy isn’t like anything that you’ve ever seen before, but I don’t have to tell you that. If you’ve watched the trailer you know exactly what I’m referring to. The story takes place in a world that echoes shades of reality, but is almost entirely fantastical and extreme. This bizarre trip you take as an audience member should be expected because of the intense visual aesthetic of director Panos Cosmatos (Beyond the Black Rainbow) but also because of the subject matter (LSD, and other, “drug” use). Throw in Nicholas Cage and you have a film that comfortably lives between fantasy and… whatever horrific world lies beyond. This style and aesthetic has heavy implications for the film, as the performances and plot are dramatic and compelling—but how that aesthetic shapes the way you see the plot is almost as important as the plot itself. The explicit question: Can Mandy be a film that is intensely dedicated to it’s impressionistic aesthetic and bizarro world, but also be intelligent and compelling, and ALSO be enjoyable for audiences? Panos Cosmatos’ Beyond the Black Rainbow truly is a must watch for sci-fi, fantasy, or art film lovers. It’s distinct aesthetic and shaking, boiling, under-the-surface fury is something to behold and a dramatic departure from the norms of the genre. That aesthetic might not be as extreme in Mandy, but it trades that for a certain nuance that makes the experience easier for a wider audience. In fact, there are certain scenes of Mandy that almost feel conventional. This film-making technique leans much more into the horror genre than some audience members might be expecting and depending on what you want from Mandy, that could be a good or bad thing. The moments of humor really make you realize how different Mandy really is from Cosmatos’ other work and it’s clear the intent was to acknowledge the genre the film leaned towards. All that being said, I think the biggest compliment you could give the film is that it juggles these audience expectations well. It plays on the horror and sci-fi genre in ways that genre film aficionados will appreciate but doesn’t jump fully into the pool, which allows it to still be a immediately recognized as a film by Panos Cosmatos. 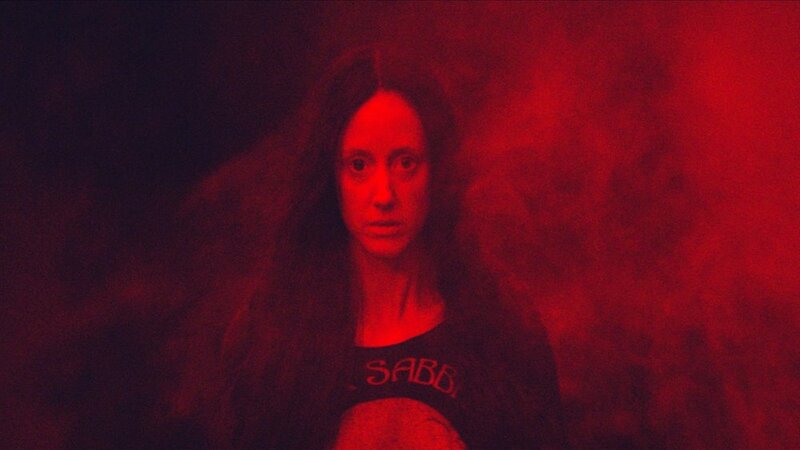 Probably the biggest change from Beyond the Black Rainbow is that Mandy is fun. Fun in the ways that a film so dark has to be to have some emotional dynamics. Of course, I’m not saying that the extreme violence (and there’s plenty) is fun, but there are so many moments where things get so extreme, you almost can’t help but smile— and the truth is you’re smiling with the filmmakers, not at them. Example: “Jesus Freaks” summoning heavily armored ‘Hellraiser’ style demons (the Black Skulls) with the sacred Horn of Abraxas might evoke some cinematic fear, or tension, but it’s so off the wall that you’re almost laughing at how gutsy it is. This never took me out of the film, but it certainly never made me take it as seriously as I did Beyond the Black Rainbow. That self-aware brand of crazy is very appealing when done correctly, and Mandy pulls is off almost flawlessly. For all of the extreme aesthetic and intense other-worldliness of Mandy, when you place Nicholas Cage in as Red, his very impressionistic acting style starts to feel like it belongs. When the filmmakers are so overtly affecting your perspective with bizarre lighting and post effects, the melodrama starts to look more like directorial intent, whether it is or not. This makes a film that is already just chock-full of directorial intent and theme that much more interesting, and it does so without making the film any less, “fun” to watch. Mandy is not a film that you’ll forget about soon after watching. It’s an intelligent film, that disguises itself in genre and intense aesthetic. Most of all, it’s a film that should be seen, not described. NOTE: You might be wondering why I spent so much time in this review comparing the film to Cosmato’s other film Beyond the Black Rainbow. It’s pretty simple: It’s just hard to compare it to anything else, and when it’s hard to compare things it’s easiest to find some place to anchor your thoughts. In this case, the anchor really had to be Beyond the Black Rainbow because Mandy is so clearly kin to it.